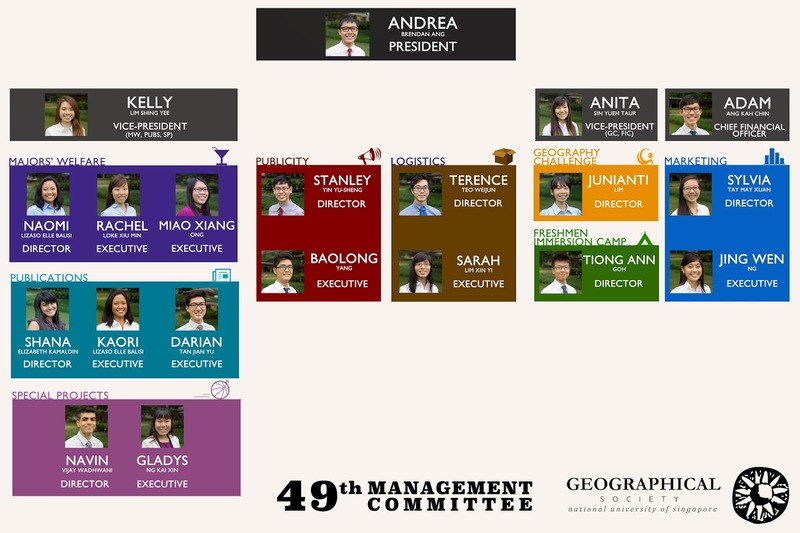 The NUS Geographical Society is a non-profit organisation dedicated to serving the needs, welfare and aspirations of students of Geography in NUS; in maintaining a strong and close relationship between the student community and faculty at the Department of Geography; and in promoting the discipline of Geography amongst the Singaporean student community. The Society enjoys a long history and tradition of close ties with the Department, extending back to the days of the former University of Singapore. Today, the Geog Soc (pronounced “JEOG-SOCK”), as it is affectionately referred to, still serves as the umbrella body under which students reading Geography can find both academic and social support. This is achieved through the numerous activities organised throughout the year. The logo captures the dynamism and vibrancy of the Society. The sunflower is used as a metonym for the environment, reflecting the essence of geography. The striking stylised image of the sunflower also captures the spirit of geographic concern with human-environment relationships. The outreaching petals of the flower are representative of students’ quest for greater knowledge as well as the Society’s bid to reach out to all students.